remarkable woman who made the Colorado Trail a reality. Take a moment and look south. 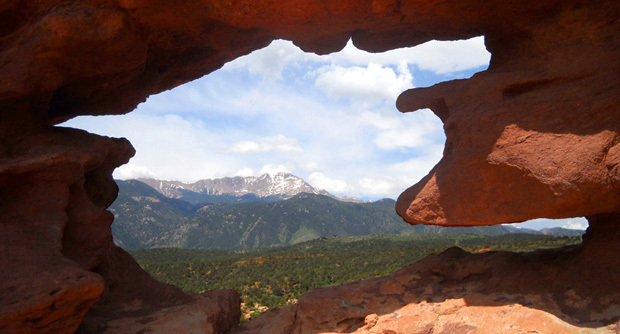 popular day-hike destination for locals, so expect plenty of company." 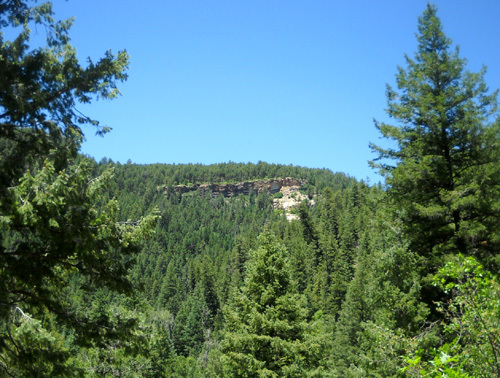 I said back in 2006 when I did Segment 28 of the Colorado Trail in the southbound direction that I�d like to do all or part of it again someday because it was so rainy the day I did it (July 9) that I couldn't see much of the canyon, let alone any distant views like the one described above. 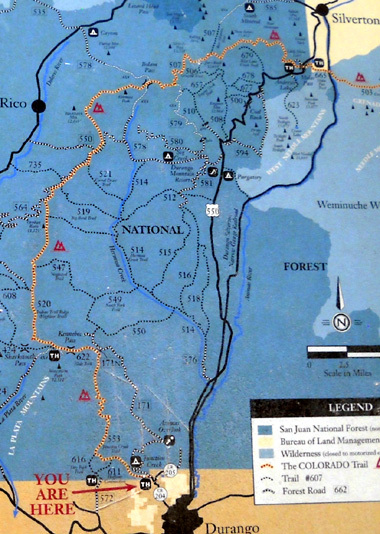 the maps shown here are posted along the trail. That got me thinking about doing the 19.1-mile section uphill while we're here this year. 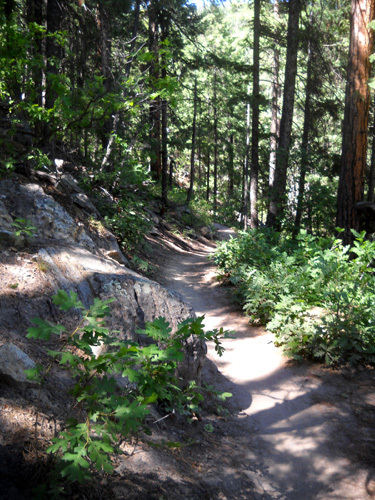 It's more than a 4,700-foot elevation gain from Durango to FSR 171 N. Doing it uphill would be easier on my knees than downhill like I ran it five years ago. A second problem is that it�s a long, slow drive on dirt FSR 171 N. to reach the trailhead I'd use at the north end and we no longer have 4WD. 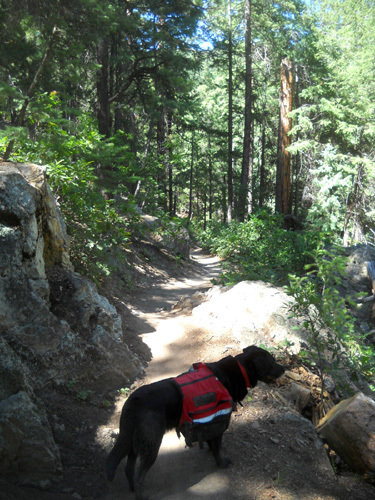 What if I spent hours hiking from Durango to that trailhead and Jim couldn't drive in to retrieve me? 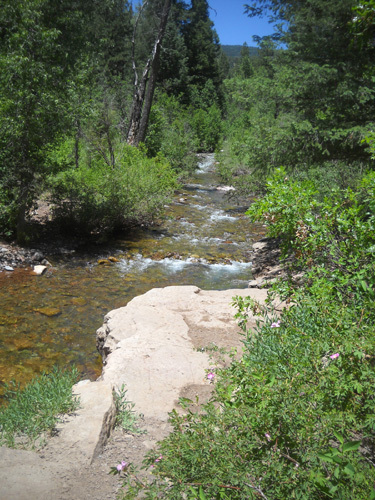 A third consideration is how high Junction Creek is with all the snowmelt; although there are some bridges closer to Durango, I had to ford some streams farther north in 2006. Zeroing in on Seg. 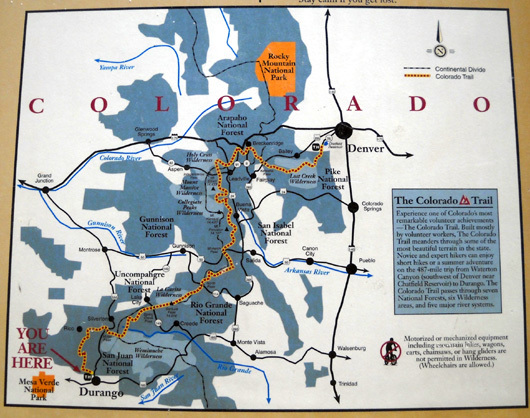 28 (orange dotted line); Durango is in the lower right corner. This sign ("You Are Here") was farther up the trail than where I started in Durango. I guess I'm a weenie. I decided we'd both have a lot less stress if I just hiked up a few miles from Durango, turned around, and went back down. Problems solved! 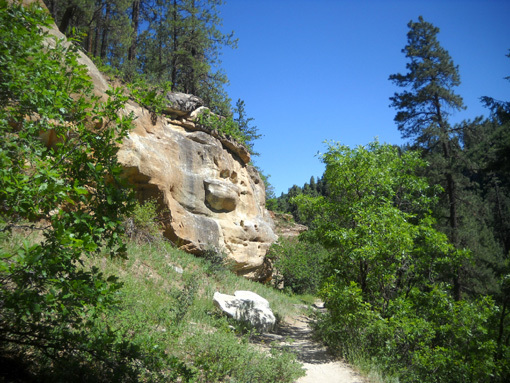 Since we had to return to Durango today for Jim's MRI, I incorporated this hike into our itinerary. It was 39 F. when we got up at 6:30 AM, with a high around 80 F. in Silverton. Temperatures reached the low 90s in Durango, where we spent the afternoon. 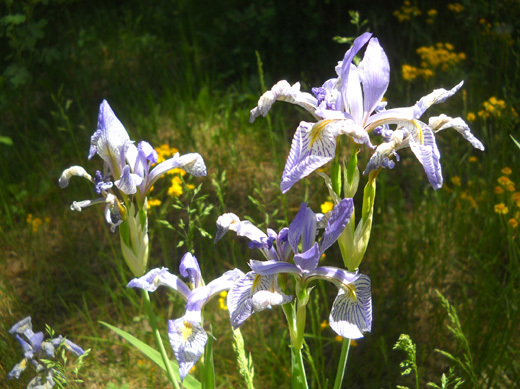 The San Juans were sunny and dry all day, making for hot but beautiful hiking weather. part of CT Segment 28 "Junction Creek Trail." After visiting some more with our ham radio buddies, Roy and Laura, we left the campground at 11:30 AM for Durango. Jim dropped Cody and me off at the CT trailhead on Junction Creek Road a little before 1 PM. We would have gone earlier to avoid some of the heat but Jim�s MRI appointment wasn�t scheduled until 2:30. While Cody and I hiked, Jim ate lunch and ran some errands before and after his MRI. We are very pleased to have gotten this appointment in only two days; let's hope that things will continue to be this efficient in a few years. (Sometimes I just can't resist an editorial comment.) Jim arrived early at the hospital complex for his scan and was done earlier than expected. He got a disk with the pictures of his knee. We can look at them but we don't know how to interpret them; we'll have to wait to find out the good or bad news until Dr. Johnson calls us. Jim got diesel for $3.84/gallon at the Durango Shamrock station. Prices came down a a little bit the last two days. 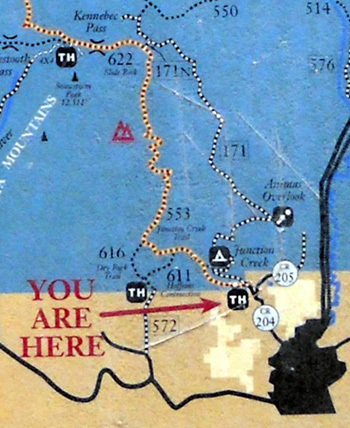 Cody and I hiked from the southern terminus of the CT at the Junction Creek trailhead approximately five miles up, past the intersection with Hoffheins Connection Trail. 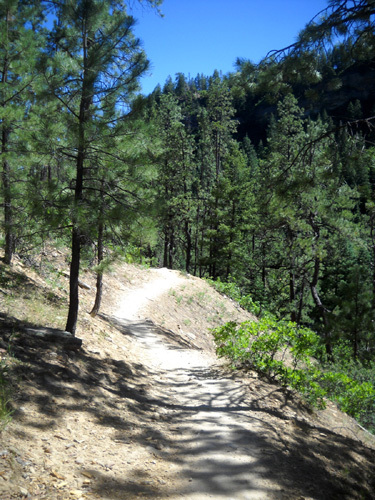 There weren�t any steep grades, just a fairly gradual uphill climb. My high point was a little over 8,000 feet for a total net gain of 1,000+ feet. It was nice to see the canyon and some distant views today, something I missed five years ago when it was raining. 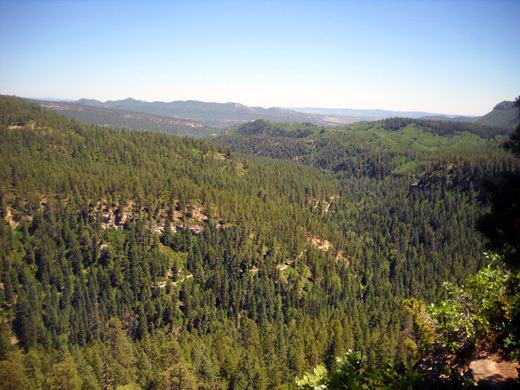 View south toward Durango from Gudy's Rest; note the trail below, which I took to reach this overlook. 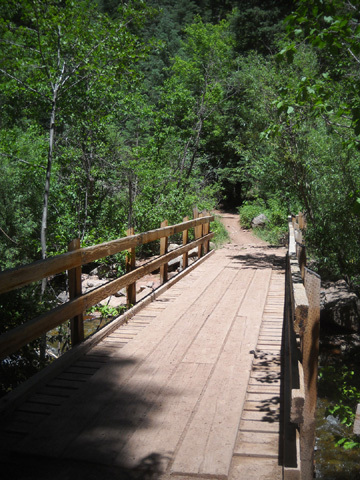 There aren�t many views like the one above because this segment is predominantly in the forest. Since I love the views above tree line, this isn't one of my very favorite CT segments. 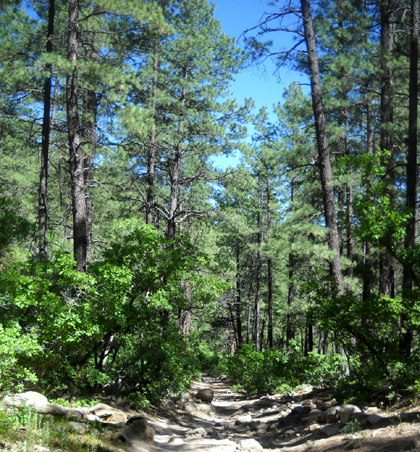 However, it's certainly pleasant to run, hike, or ride through the beautiful pine and deciduous forest. The sun was high enough this afternoon that it was a mostly-sunny hike. 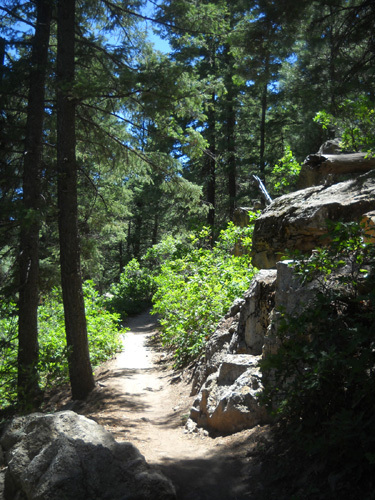 The trail is rocky and sandy at the start at just under 7,000 feet elevation in Durango. 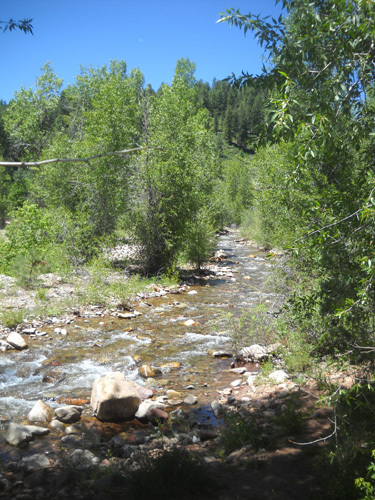 It follows Junction Creek fairly closely for about half a mile, then is several hundred feet above it for the next two miles. After that the creek veers more to the east. 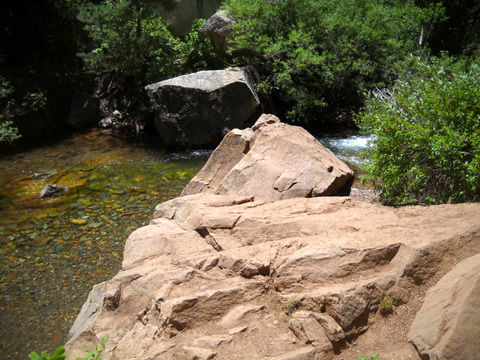 Pausing to watch the creek in places like that is very soothing. 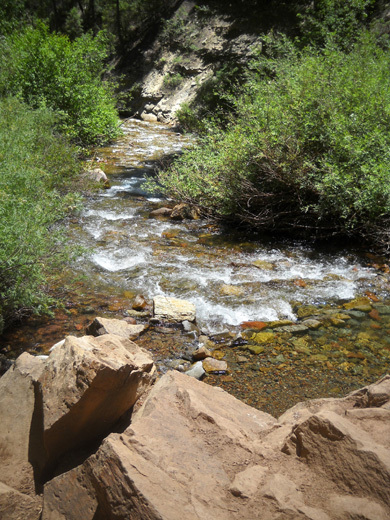 The sound of the water is cooling on a hot day, too. The creek was much lower today than I expected. I would guess that it is higher, faster, and perhaps more muddy in the evenings and overnight from daytime snowmelt at the higher elevations. We crossed the creek on a wooden bridge about 2 � miles up and that was the last chance Cody had to get in the water until we came back down. The trail surface became much harder with packed dirt after the first half mile. 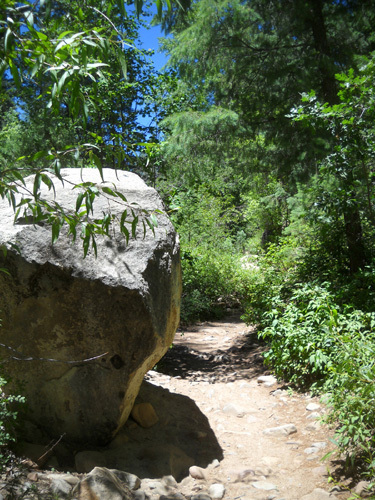 Dr. Scott mentioned to us that the trails around Durango are as hard as cement, and now I see what he means. 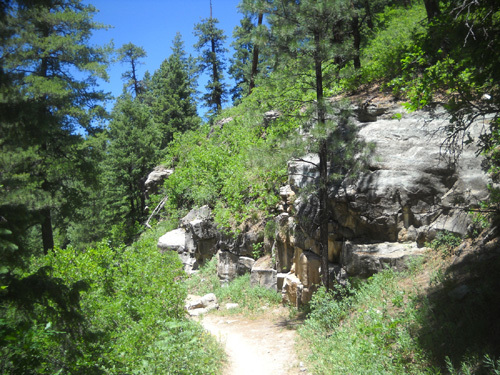 The trail is very narrow in some places, with steep drops if anyone slid off. I cannot believe how many people bike this trail! 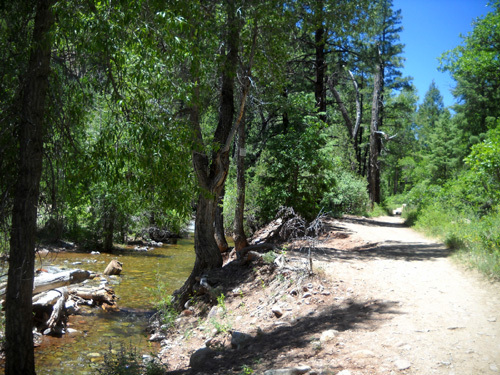 Some places on this trail appear dangerous to me on a bike, but then I'm not a daredevil on wheels (only on foot!). It doesn�t seem like it would be all that enjoyable to cyclists because of all the hikers, runners, kids, and dogs. Equestrians use it, too. I didn't see any horses on the trail today. I encountered nine bikes coming down while I was going up and four more going up when I was coming down. That was good � I could see all of them coming except around curves; none approached us from behind. I counted four runners out and back while I was outbound, and several more who were going out (mostly young women) as I neared the trailhead at the end. 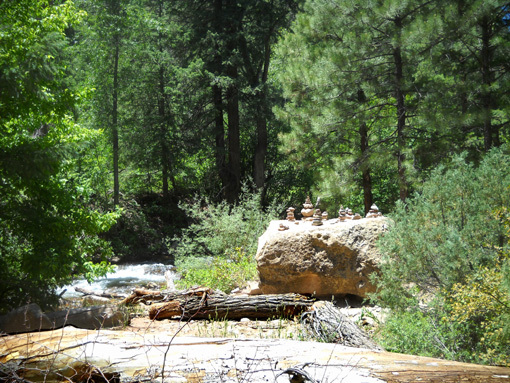 I saw about six hikers, all but one within a mile of the trailhead. There were also several moms with small children playing in the creek. 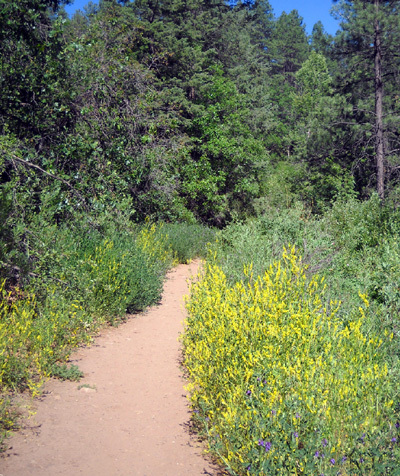 This is a busy trail after work and on weekends. 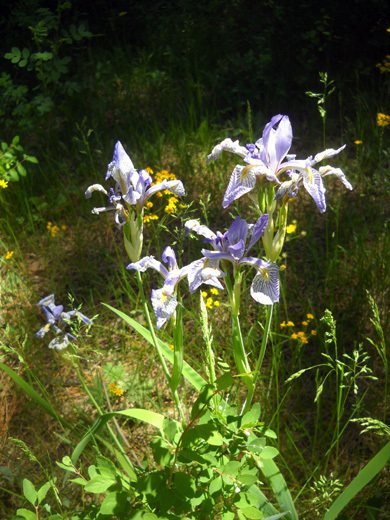 The only wildlife I saw besides birds was a deer about half a mile down from Gudy�s Rest. 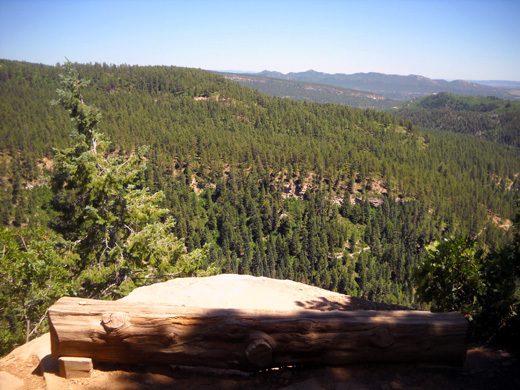 This overlook about four miles up the trail has a wooden log and scenic views toward Durango. On the way back down Cody and I stopped there for about ten minutes to eat, drink, and enjoy the breeze. cyclists, and equestrians coming and going on the trail a few hundred feet below. 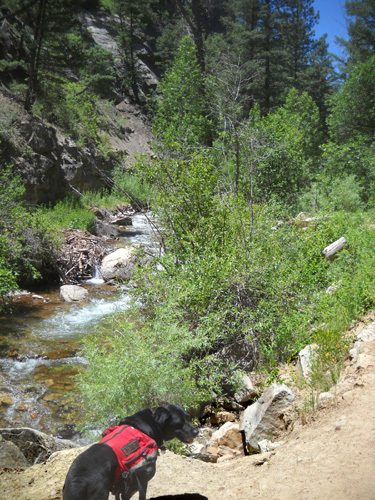 Cody and I are not heat-acclimated so we got very hot during this hike. 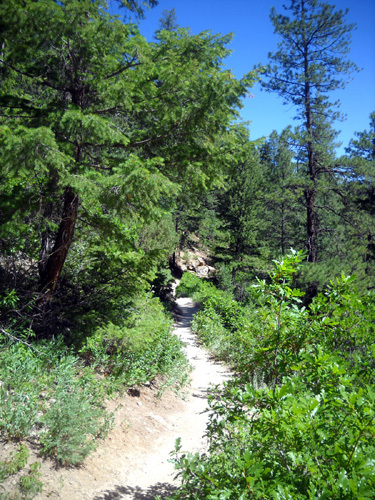 The first and last two miles through the canyon are mostly exposed to the mid-day sun. 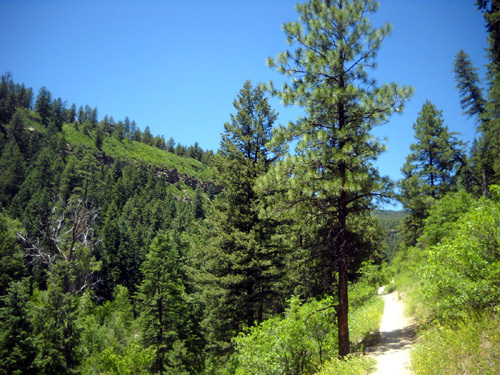 Farther up there was more shade in the pines and aspens. I let Cody in the water several times and gave him water from his pack three times. 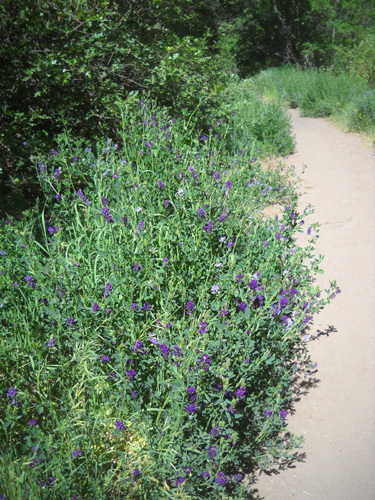 The flowers and foliage look pretty good, despite the drought conditions. It was only 8% humidity tonight in Silverton and probably about the same in Durango. I�m glad I finally got to see this part of Seg 28 on a sunny day. When I ran/hiked all the CT segments in 2006 and 2007 I chose mostly-sunny days; this was the only rainy one except for a couple afternoon thunderstorms at high elevations. Back then I would have rated it near the bottom on my list of favorite CT segments because there weren't any views. Now I have a better appreciation of this segment. I got back to the trailhead about 4:45 PM and Jim was already there. The scenery between Silverton and Durango is beautiful, especially with the snow and waterfalls, so I didn�t mind the hour-plus drive back home today. 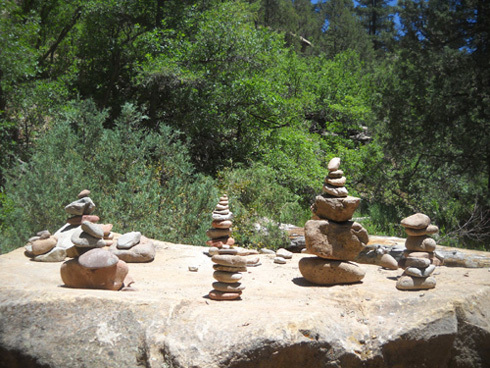 It's going to get expensive and repetitious if we have to drive down to Durango again, though. When we got back to our campground in Silverton there were more RVs and tents but not as many as I expected. We saw quite a few on US 550 going in both directions today. After supper Jim went to the A & B campground at the far end of town to do two loads of laundry. That�s the best place we�ve found in Silverton. He got more water at the visitor center and filled the tank when he got back. We get water in our six-gallon containers almost daily. I walked around the CG to see how high the creek is � muddy again tonight, and the highest I�ve ever seen it. Every night this week it's been a little higher when I've observed it. It�s almost up to the RVs next to the creek! I�d be worried about it every night if we were camped over there.